Back in January, I shared a list of at home date nights; the 14 Days of Love. It is so easy to go out to one of the many fabulous restaurants in Chicago, but, since leaving teaching, we are on a stricter budget. Therefore, we need to get a bit more creative. One of the date ideas I shared with all of you was doing an at home Wine and Cheese Date Night with homemade brie bites. We have actually done this a couple times since January, and it has been so much fun. It’s nice and quiet, which means we can actually hear each other compared to the loud bustling of a Chicago restaurant. We don’t own any table clothes (which might seem weird) but I had a piece of scrap plaid fabric that I laid over the table. Then, I lit candles in different heights so the light would bounce off the glass nicely and so it would be bright enough to see the appetizers and cheese. All other lights off. We are going for a touch of romance, here. You definitely want to also play some music. Soft or instrumental music will help set the mood and help create peaceful quiet. I love having moments of content silence with my husband, but I find it happens more comfortable with a little background music. Wine: we like to try a couple different options: definitely a white and red and sometimes a little sparkling. One thing that helps us do that without having to drink all the wine or wasting the wine is the Vacu Vin Wine Saver Vacuum Pump . It is a life saver!! Seriously – if you love wine, you should check this out. Cheese: We always buy a few different cheeses. There is always a brie, which you will also see in the recipes below. We also love having a goat cheese and a different cheddar. Plus, be willing to pick up something random and try a new cheese. It’s most fun when you try new things and flavors. For example, we tried a Mango-Fire Cheddar. It ended up being too hot for the both of us, but it was still fun to experience together. Other Food: Don’t just have cheese. Try having a warm, fresh load of bread and a couple different crackers. Our favorite crackers are the Carr’s Table Water Crackers . They are perfect for tasting cheese! I also recommend grapes, apples, pears, or berries – yummy, healthy and a perfect pallet cleanser. Olives and nuts are also a delicious choice! AND these yummy brie bites! 1. 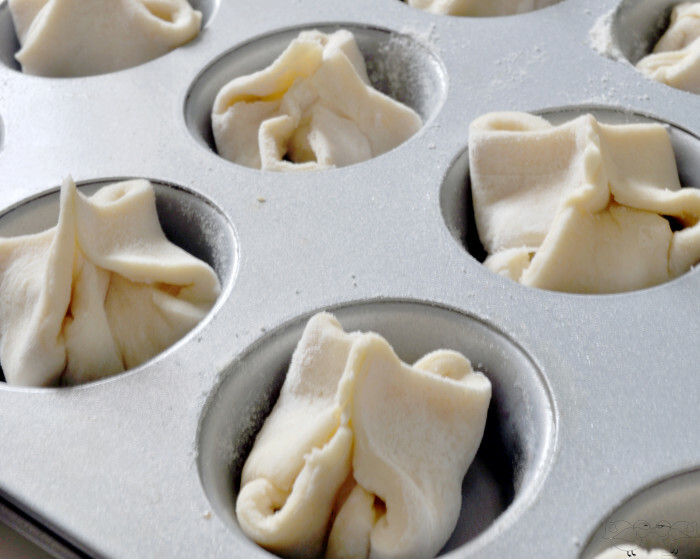 Once your puff pastry sheet is defrosted, cut your pastry into 16 pieces (4×4). 2. Lightly spray a mini muffin pan with cooking spray. I take a paper towel and lightly wipe the inside of the mini cups because I want to make sure no cooking spray is puddled. 3. Place one square into each mini cup. 4. 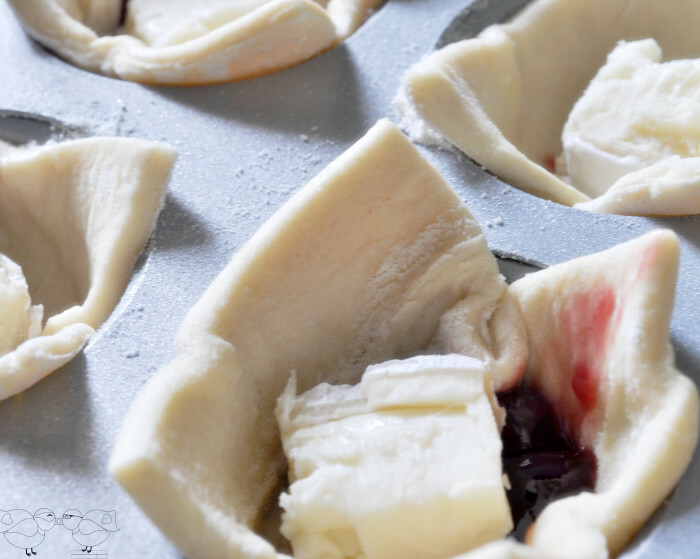 Add a small amount of raspberry jam into the middle of each pastry cup. 5. Then, remove the outside edge from your brie and cut 16 little squares. Place each of these squares into one of the mini pastry cups. 6. Take each 4 corners of the puff pastry square and pinch together into the middle. 7. Bake at 375 for 15 minutes. You want your brie bites to be a nice golden brown. 8. Let them cool for a few minutes and then top them off with a fresh raspberry. Partially because it is pretty! And THEN I made these Pear, Honey Pecan Brie Bites! My husband doesn’t normally like pear, so I wasn’t sure how he was going to react to this bites. He definitely loves the raspberry more, but he said he was pleasantly surprised by the pear. What I like most about them is they have a little more “bite” or crunch to them because of the pear and pecan. 4. Add a small amount of honey into the middle of each pastry cup and add a pecan on top. 5. 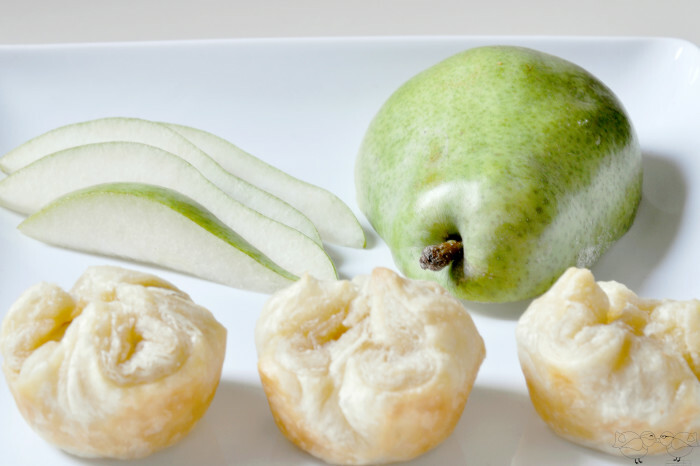 Cut your pear into 16 little bites and place into the cups with the honey and pecan. 6. Lastly, remove the outside edge from your brie and cut 16 little squares. Place each of these squares into one of the mini pastry cups. 7. Take each 4 corners of the puff pastry square and pinch together into the middle. 8. Bake at 375 for 15 minutes. You want your brie bites to be a nice golden brown. If you desire, you could also top off this brie bite with a little bit of fresh fruit. I thought it might be a bit tougher to eat compared to a soft recipe, so I left them blank. I love both of these brie bites so much! I love serving them with some fresh fruit on the platter – it is pretty and let’s your guests know what flavor they are eating. I hope you give these a try as well as a Wine and Cheese Date Night at home. Don’t be intimidated by picking out wine and cheese – just have fun with it and be open to random selections. Do you have a favorite wine or cheese we should try? These sound so lovely! I would love to make these for Tapas night or we have Happy Hour sometimes where we have lots of friends over. I would make them for Happy Hour as well. Though, I’ve never understood why it’s called happy hour if it lasts for so many hours! LOL Thanks so much for sharing your recipe. Awww! What a sweet way to spend the date night with your husband 🙂 Those looks delish and healthy too 🙂 It saves some bucks than going outside for a date night. Yum. That food looks delicious. I’m not that much into cheese and wine, but my hubby is. Big time. I will make this for him. What a lovely way to spend an evening in with your husband. Both appetizers sound delicious. I love fruit and cheese together and add in some puff pastry and heaven is achieved. Love it! Except I would be the one gorging on the delicacies! Wow those look SUPER good. I’ve never had any type of appetizer like this- thanks I will have to give this a try! OH MY GOODNES, this looks so good. 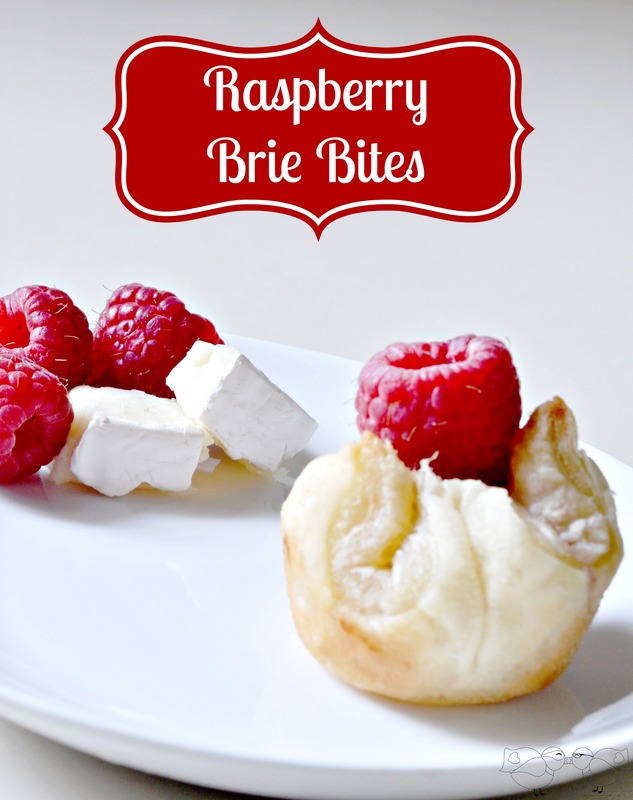 I love brie, so I am going to have to try making these. That looks so delicious!! I have some creative ideas to cook now myself!! This is a fantastic idea for a date night at home! I love how easy your recipes are, yet they look so fancy and perfectly romantic! I also love brie and fruit! I add it to our meals as a special treat. Those bites look really good. I like how easy they are! Great date night snack. This looks delicious! I love bree in puff pastries, especially with a little bit of apricot. I’ve never had brie cheese actually, but it looks delicious. I’d love to try these out, they look really yummy! this looks so good! I love Brie cheese! THIS dessert sounds amazing! I love the idea of staying in for a date night! It can be so crowded and loud when you go out to eat, so the quiet would be enjoyable. Your bites look amazing ans so easy to make! I have a big hankering for brie! A weakness for sure! Mmmm those pear bites look awesome! This would be a fun date night at home. I just love dating my husband! These brie bites look wonderful! Wow! Those look delicious! I love puff pastry, and that fruit looks so fresh! 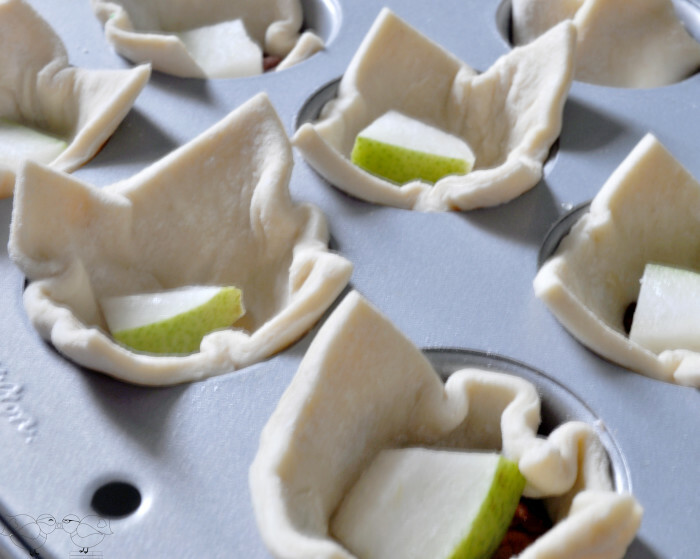 These would make fun little appetizers or desserts at summery parties! These look so delicious! I need to make these for my husband because brie is his favorite. I’ve pinned this! Awesome recipes, so easy but looks like it took a lot of time! I love this whole idea of dating at home. So sweet and romantic!! Give me those Brie bites! Delicious! We so need a date night every once in a while. I’m not sure which I love most. They both look fabulous, and the bite size means I really can have one of each! G’day! I love anything brie! YUM! I love the idea of date night at home. These look so good too! What a great idea! I love wine and it would go great with these. 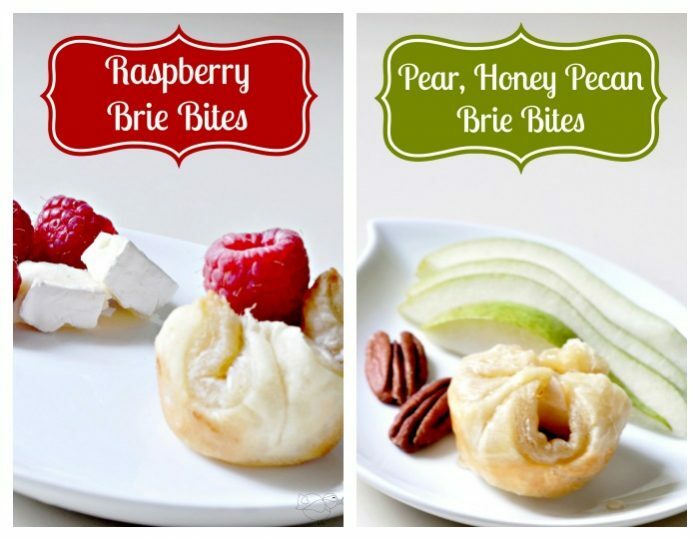 i’d love to try the honey pecan pear with brie. 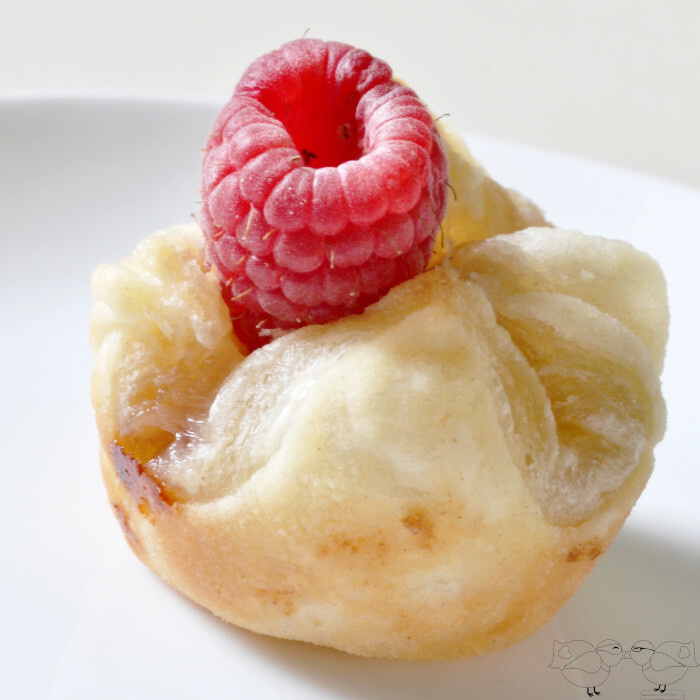 The raspberry brie bites look so yummy! Lovely pairing. I love anything with Brie in it! These little bites look delicious. I don’t think I could stop at just one. Usally I eat my Brie on french bread with a little bit of strawberry preserves on top. You make this look so easy! You have inspired me to try it. I love brie. This is a great idea for a date night. Your brie bites look delightful. oh! What a great idea! We always have kids at home, teens and tweens, so going out is our escape, but I’d love to make these for a party! Wow, you guys do it up right in your house!! We are lame and usually just eat chips & salsa. That sounds yummy. I love Brie. We don’t have it often, but it is one cheese we both agree on. The pear bites sound better to me than the raspberry, but I’m a big pear fan. Especially in the summer! These brie bites look so delicious. I don’t think I have ever had brie. That is brilliant. We love brie, fruit, and pastry: combing them all must be so delicious! Thanks! My husband and I do something similar when it’s just us. I usually buy a fresh baguette, fresh berries, and some of our favorite cheese and set out a plate for us. We make it our dinner, and then have a special dessert. We’re not big wine drinkers, but we love cider, so we usually drink that. Our favorite cheese are havarti, muenster, and this amazing marinated mozzarella. I think it’s marinated in garlic, olive oil, and sun dried tomatoes. It’s so good! We like to have at-home date nights often, especially now that we have a 4 month old. I like bite recipes like these, as you can indulge without packing on a ton of calories. These look fairly healthy too! These both look absolutely delicious! This is a fun twist on baked brie. I like the pear addition. This sounds fun and so romantic! Great recipe too, I’m loving Asiago cheeses these days and I’m always game for a fruit forward Pinot Grigio and a peppery red wine! Now that’s a date night, I can get with!! I love a sweet wine and any kind of cheese! 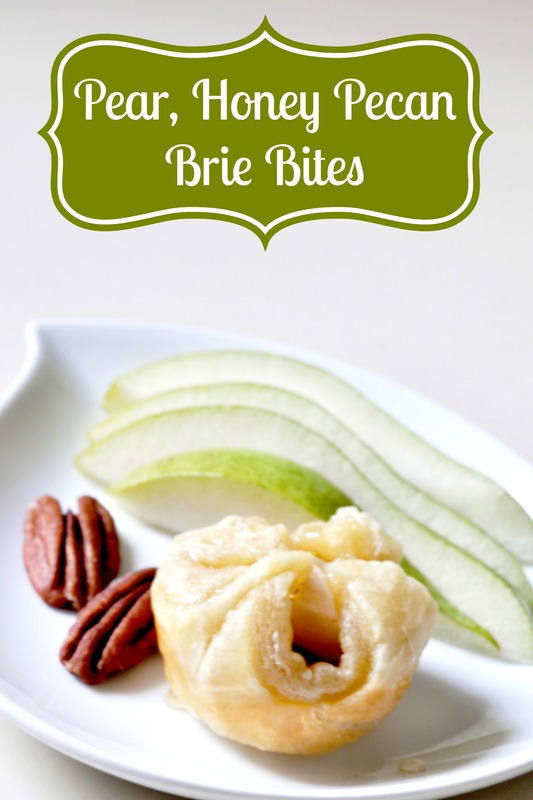 My Hubs loves Brie cheese, I need to make these little bites for him some night. I also need to do a date night once in awhile.